Our interests lie in the development of new bi-radical reagents for signal enhancement in Solid State MAS NMR. Particulary reagent systems that can be used to improve the signal to noise ratio in the anaylsis of membrane bound proteins. Key paper. We are also interested in developing selective flow devices that can be programmed to take organic building blocks and through reversible reactions evolve target compounds with pre-deterimined properties. Coming soon-hopefully! We also use carbohydrate chemistry to devise new chiral phases for chiral HPLC and flash chiral chromatography. Key paper. 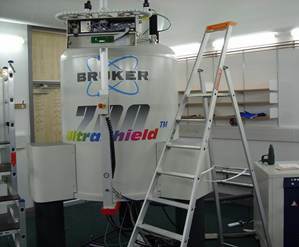 A Spectrometer for 6.7 and 14.1 T DNP-Enhanced SolidState MAS NMR Using Quasi-Optical Microwave Transmission. K. J. Pike, T. F. Kemp, H. Takahashi, R. Day, A. P. Howes, E. V. Kryukov, J. F. MacDonald, A. E. C. Collis, D. R. Bolton, R. J. Wylde, M. Orwick, K. Kosuga, A. J. Clark, T. Idehara, A. Watts, G. M. Smith, M. E. Newton, R. Dupree, M. E. Smith, J. Magn. Res. 2012, 215, 1-9. Chiral discrimination in mobile phases for HPLC. R. Lukac R, A. J. Clark, S. Khalid, A. Rodger, A. Snedden, and P. M. Rodger. J. Mol. Liq., 2002, 98-99, 411-423. Predicting Chiral Discrimination in HPLC from Computer Simulations R. Lukac R, A. J. Clark, S. Khalid, A. Rodger, A. Snedden, and P. M. Rodger. J. Mol. Liq., 2002, 261-272.